Yes, the Festival season is upon us, which you’ll see as you read below. Cape May has managed to create a tremendous number of events that are sure to give you an excuse to return to Cape May (as if anyone needs to be convinced of such a thing). 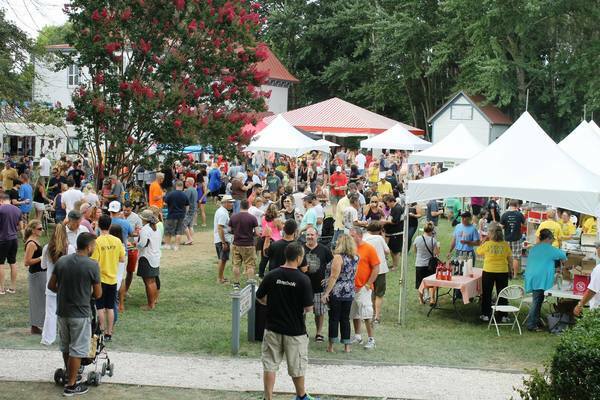 The season kicks off next weekend with the 5th annual Craft Beer & Crab festival. 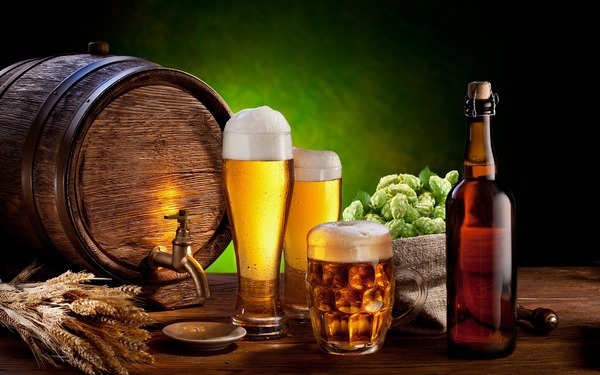 It is followed about a month later by the Cape May Food & Wine Celebration, which culminates with the Harvest Brewfest. On Columbus Day Weekend the New Jersey Wine Growers association’s fall festival returns to the Cape May area at Navel Airstation Wildwood. Finally, the fall edition of the Exit 0 Jazz Festival is being held this year on November 11-13. I’ll be detailing each of these festivals for you in this edition of our newsletter. If you have any interest in food, wine, beer, or music then you’ve got to be intrigued by at least one of these. They are all wonderful events and a great excuse to come (back) to Cape May for another visit. Availability Alert! If you haven’t yet planned your summer visit to Cape May and were thinking it was too late, I have happy news for you. In addition to the various small openings we have throughout August, we still have a fair amount of availability the week of Monday, August 29, into Labor Day weekend, including a few rooms left for Labor Day weekend itself! You know these won’t last long, however, so call us at (609) 884-8702 or visit our website to reserve one for yourself before it is too late. I was amazed to discover that I hadn’t featured Knightsbridge in our newsletter in over 3 years. Not only is this one of our most popular rooms, it was recently remodeled, and now features a wonderful bathroom & incredibly dramatic king sized bed. In fact, last month I featured the new chairs that were just delivered for Knightsbridge in the “More New Stuff” section of our newsletter. Knightsbridge is located on the 3rd floor of the Prince Albert building. 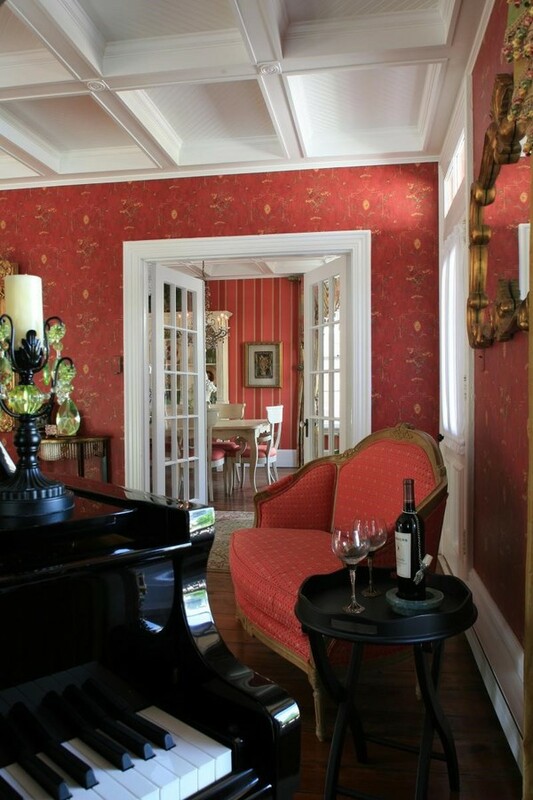 The decor of Knightsbridge is subtle, with a soothing, understated elegance that is sure to put you into that relaxation zone that you’re looking for in a trip to Cape May. The new chairs that we recently put into the room are incredibly comfortable and still manage to convey a sense of style and grace which is missing from most modern furniture (they replaced the vintage sofa you see in the lower right corner of this photo). If you love a wonderful bathroom, then Knightsbridge is the room for you. The 2-person/2-head shower, with its amazing skylight above, is the perfect place to start your day. The tile work, which wraps around the sink and counter, adds drama to the room, while the stained glass window that runs along the adjoining wall is joy for the senses. Knightsbridge is also conveniently close to the roof deck, so you’ll be able to sneak out for a quick sunset glass of wine before you head out to dinner, or a cup of coffee before breakfast. Think of it, a weekend at The Queen Victoria, an afternoon of beer, food and live entertainment. What more could you possibly ask for on a September weekend? This year’s lecture, “Our Nation’s Security: How Intelligence Affects the Future”, is being presented by Joan A. Dempsey, who is perhaps the most distinguished speaker we’ve had to date (she is also the first female lecturer!). Joan is currently the Executive Vice President in Booz Allen Hamilton’s defense and intelligence business, where she leads the National Agencies Account. During her 25 year career in the federal government, Joan held political appointments twice: first, in President Bill Clinton’s Administration where she served as the Deputy Director of Central Intelligence for Community Management; and, in President George W. Bush’s Administration, as the Executive Director of the President’s Foreign Intelligence Advisory Board. This really has become a World Class Festival, that you won’t want to miss if you are a Jazz fan. In addition to the headliners, I suggest you check out Davina and the Vagabonds for a fun-filled, up-beat experience. I suppose to the casual observer, this may look like just another set of stairs. To me, however, they look like an incredibly stable, handsome, and beautifully designed and crafted, solid mahogany set of stairs. What isn’t necessarily obvious at first glance is the exacting effort required to lovingly craft the stringers, risers, newel posts, and finials in our shop (thankfully, the original vintage spindles and rails were perfectly serviceable!). As is usually the case when working on old houses, one thing leads to another. Once the steps were replaced, we discovered that we also had to re-lay the brick walkway leading to the steps, and subsequently, reinstall the front gate, which no longer cleared the brick walkway. In the end, we’re thrilled to have a nice looking set of stairs for the folks staying in Whitehall and Brighton to use. Most of you have probably strolled past Cape May’s Rotary park on one of your visits to town. Located between Colliers Liquors and Cape May Stage and Louisa’s restaurant, it was almost inevitable. Our Christmas season visitors will probably remember it because of the city Christmas Tree which was always displayed in the centrally located gazebo. For many years the park had been looking pretty forlorn, with overgrown landscaping, a pitiful lawn, clunky concrete form benches with rotting seat planks, and a collapsing gazebo. I guess you can tell how I felt about the park from my description of it! Last year a joint public/private effort began to design and build a world class park. Demolition of the old park finally began in March, with construction commencing immediately after. Our rainy May weather delayed the completion of the park in time for its scheduled July 4th opening, but we were pleased to see the park officially open on July 22. The park is absolutely beautiful. The picture above is obviously taken near the fabulous new fountain, which is located in the center of the park (about where the old gazebo was). In the background you can see the beautiful new gazebo. You can also see some of the classy looking benches which line this pathway, and which are distributed throughout the park. If you REALLY look closely, on the left you’ll see the the gorgeous vintage looking iron fence that surrounds the park. The lawn is brand new and perfect, of course, and we’re very hopeful that it will stay that way thanks to the irrigation system that was lacking in the old park. This is now a park that calls out to be visited and enjoyed by locals and visitors alike. 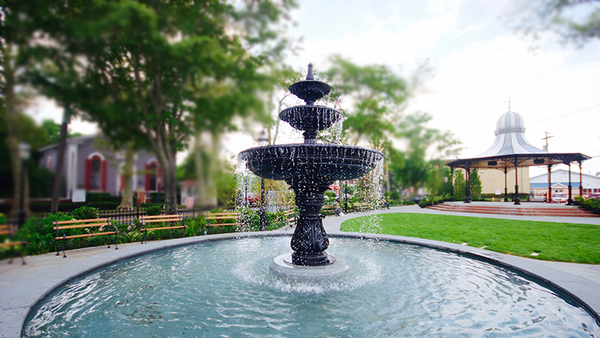 It is the perfect place to while away a few minutes and enjoy the serenity of the park in between shopping, dining and your explorations of Cape May. It is also a tremendous place to enjoy one of the many free concerts that are held in the gazebo almost daily throughout the summer. Normally our “favorite photos” are submitted to me by guests. We got this one in the mail the other day, and I thought it would be fun to use it as my “Favorite Photo” this month. 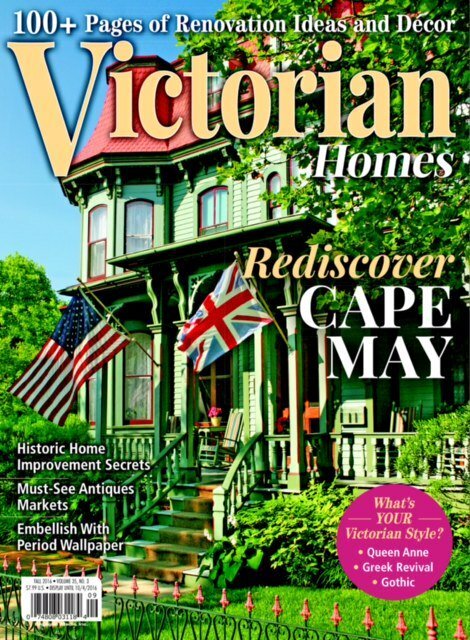 Anna Marie and I knew that The Queen Victoria was going to be featured in the fall 2016 edition of Victorian Homes, but we were So Surprised to see our beautiful Queen Victoria building gracing the cover! The Queen Victoria has been featured in many magazines over the years, of course, but not too many covers. I can’t imagine a more appropriate magazine to make such a big splash in. If you want to order a copy for yourself, visit their website (starting August 2nd). You can order individual copies, or subscribe for future fun. Yes, The Queen Victoria car magnet has returned! Our first generation of magnets was one of our most popular gift shop items ever, so it shouldn’t come as a surprise that we’ve decided to feature them again. All summer long I’ve seen cars lining the streets of Cape May with our vintage magnets, obviously the vehicles of veteran guests of The Queen Victoria. While those original magnets were attractive, the outside text was a little hard to read. The new magnets are still classy and good looking, but now it is easy to see that “QV” is The Queen Victoria B&B in Cape May, NJ. At only $2.95, the least expensive item in our gift shop, it is easy to take this little piece of The Queen Victoria home with you. Just imagine being reminded of the wonderful times you had on your vacation here each time you walk up behind your car in the parking lot. This is a bit of a departure, as our “Fun Things to Do” are usually oriented towards activities. I wanted to share this new service with you, however, and I figured it would work in this space. Cape May is all about being “Car Free” (and care free), but there are times when your destination, be it dinner or an attraction, is a little bit further than you might want to walk. In the past that generally meant moving your car from your treasured parking space. This year there is an alternative. 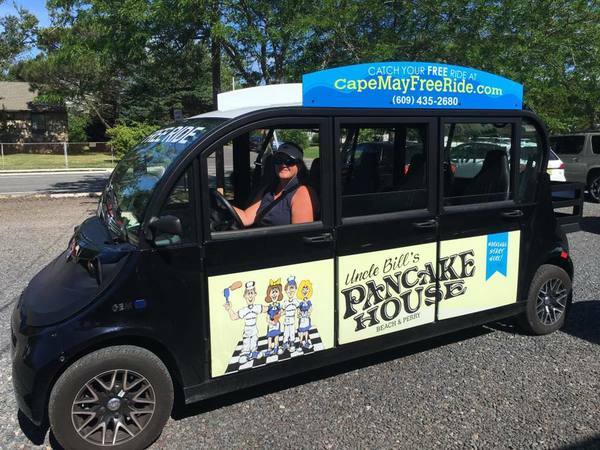 The owners of “Cape May Carts”, who rent golf carts here in town, started up this free service this year to take you anywhere on the island that you might want to go. We’re THRILLED about it. It is reliable, fun and free (almost). Here is how it works: Call them up about 15-20 minutes before you need to be wherever you are going and tell them where to pick you up. They’ll arrive shortly thereafter and drive you to your destination in this street-legal, seat-belted, fun vehicle that has seats for 5 people besides the driver. Though they don’t charge anything for this service, they are actually working for tips. Anna Marie and I have used the service a couple of times ourselves to go to Sapore Italiano in West Cape May. We tipped them $5 for the ride there and walked home after dinner. Many of our guests have used the service as well, and all of them have loved it. Each year we sponsor a production at Cape May Stage. 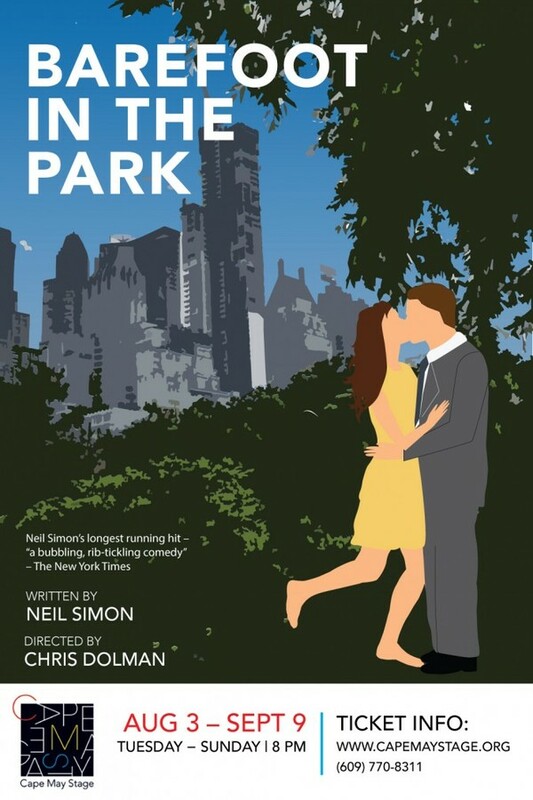 We always try to do a fun or romantic show, and “Barefoot in the Park” satisfies both of those criteria. I’m pretty sure that the cast in our production won’t be quite as good looking as Robert Redford and Jane Fonda were in the film back in 1967, but I’m confident that the performance will be wonderful. Anna Marie and I were planning on reproducing the poster you see on the right with a picture in our new Rotary Park, but I just couldn’t bring myself to put on a suit on one of our sultry summer days this week. Actually, Anna Marie probably could have persuaded me, but we couldn’t manage to fit a photo shoot into our schedule this week. If you’re looking for a fun evening out during your upcoming visit to The Queen Victoria in the next few weeks, plan on making it to the theater one evening. I know you’ll love the experience. The other day I recommended Louisa’s Cafe to some of our guests as one of our real favorite restaurants this summer. They took our advice and loved it (which always makes me smile). In fact, they loved it so much that they decided to dine there again 2 nights later. Louisa’s is that kind of place. Louisa’s is a small, quaint, and charming restaurant located on Jackson street, just off the Washington Street Mall. 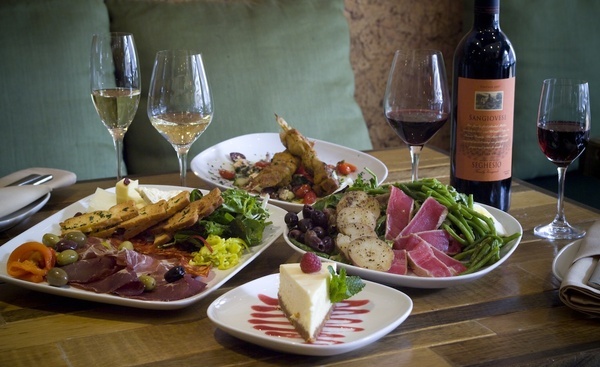 It is a farm to table restaurant, and has been since WAY before that trend started. Who knows, perhaps they were the first one (somebody had to be). In any case, it has long been a favorite of those in the know. When you walk in the restaurant, you’ll see the menu on the blackboard at the back of the restaurant. You won’t see any beef on the menu, but there is always a great selection of offerings, usually with a lot of seafood. 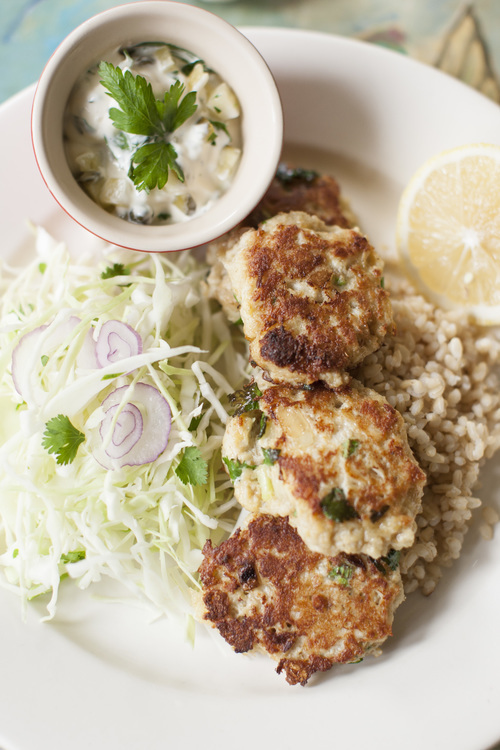 The crab cakes featured in the picture above are certainly one of my favorite go-to dishes at Louisa’s. Anna Marie usually favors the pan-fried flounder. We can never resist one of their wonderfully fresh and interesting salads, and desserts are always tempting too. One of the things I love about Louisa’s is how I feel when I leave. Louisa’s is “light” fare. Everything is fairly simply prepared, but perfectly so. I’m never stuffed when I leave, and I’m usually already planning our return visit. If you haven’t tried Louisa’s before, I highly recommend it. I’m pretty sure you’ll love it. Be sure to make reservations in advance, however, as it is a small restaurant with limited seating, and it has quite a following.